Among the antiquities which are to be transferred directly to Italy as a result of the October 30 2007 agreement between Princeton University Art Museum and Italy is a polychrome terracotta architectural relief with a centaur (inv. no. 1995-129). Details of the original acquisition appear in the Record of the Art Museum, Princeton University 56, 1/2 (1997) 61, 62 (ill.) [available on JSTOR]. Gift of Ali and Hicham Aboutaam. These brothers now run Phoenix Ancient Art S.A. which has galleries in Geneva and New York. The year the Princeton terracotta was presented by the Aboutaams coincided with the "incorporation" of Phoenix Ancient Art. Does he have any statement to make about why his gift to Princeton is now being returned to Italy? What was the source for this architectural relief? 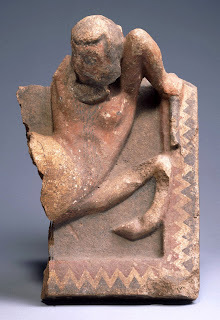 Columen plaque with a Centaur in Relief (terracotta, painted). Etruscan, southern Etruria or Latium, ca. 500-480 B.C.